At Classic Landscape we offer highly professional landscape gardening and garden design services in Solihull and the surrounding areas. We can turn our hand to any type of garden, should it be a contemporary style using modern materials, or a classic, natural style for that English country garden feel. Feel at home in your garden. We try to make your garden fit perfectly with your house and its surroundings. For instance, at Barston Village we recently completed the hard landscaping for an ultra modern-style extension using the same walling materials as the house for the garden retaining walls. The combination of natural stone slabs and recessed lighting compliments the interior and creates a beautifully unique flow from the outdoors in, which looks simply stunning day or night. This year we will continue with the rest of the garden. A garden is for life, not just for summer. All our gardens look great when we're finished, but some take many years to evolve and develop; at Classic Landscape we are there to help you along the way. Over twenty-five years have passed since we completed one of our first projects near Hampton-in-Arden. At the time we helped extend the original Mill Pool to create a larger lake with an island; converted a concrete culvert into a natural stream, and planted an orchard, a Beech wood and many other trees to establish a spectacular view. 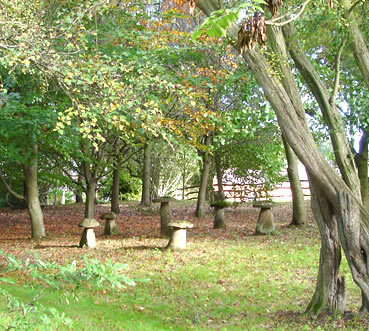 At Classic landscape it is really satisfying for us to help develop a garden over nearly three decades; to see an orchard grow from a bare field and a Beech wood develop into a magical space is what maintains our passion; as after all, turning your vision into reality is second nature to us. "Stuart and his team were fundamental in the original conversion of my garden and continue to offer advice and practical help in its development"